I was fortunate to catch this exhibition, held over the May Bank Holiday weekend at Lumen Studios, The Crypt, St John on Bethnal Green. David Marron is both an artist and a paramedic. 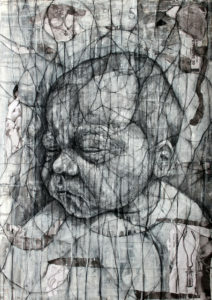 The exhibition consisted of 12 pieces, charcoal, acrylic and collage on paper, standing on and supported by crutches. These are multi-layered and complex works. As you stand before each, more unfolds with every moment of prolonged gaze. Marron’s probing work is steeped in the essence of humanness, in the complexity, vulnerability and fragility of life itself and of those who inhabit it. 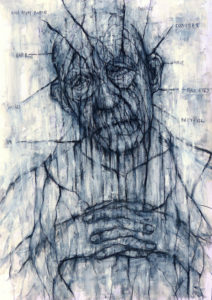 The artist’s experience as a paramedic affords him a unique viewpoint – that liminal space that he witnesses between wellness and illness, between living and dying, where life is suspended and where outcome is often unknown. Following the exhibition, I had the opportunity to chat to Marron about his work. Initially trained in fine art, his working life brought him to the world of hospitals and the unwell. 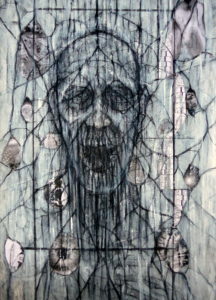 This witnessing, of the transformations and experiences of illness, changed the nature of Marron’s art. Previously, he reflects, his work had been more self-obsessed. Becoming part of the world of illness transported him away from a more personal interior world and towards a consideration of that of others. In his work as a paramedic, Marron might only spend very short periods of time with patients on their journey to hospital. The encounters that moved him emotionally resulted in a transmutation of the feelings such interactions generated into the drawings on display. Yet each piece does not represent a single encounter or a specific individual, but is rather a conflation of a number of similar emotional experiences. The piece Run Away Robin, for example, is not a direct portrait but was informed by a number of encounters with patients suffering from dementia. 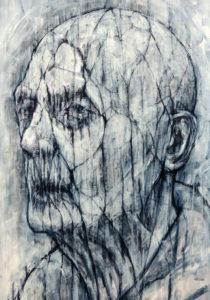 The piece represents a piecing together of the emotional fragments that Marron took away from such interactions: the nobility and stoicism that accompany the manner in which the elderly deal with memory loss; the masks they create, often using obstinacy and non compliance to hide their fears; and the fragmentation of self that accompanies the condition, here seen by the snippets of repeated words that hold meaning to the utterer even if uninterpretable by us. A Tooth for a Tooth reminded me of Munch’s The Scream – that primordial sense of pain and anguish, seemingly uncommunicable in its silence. Any yet not, as we confront the distress so vividly here on canvas. The violence of this lived experience is hard to bear witness to, and yet there is so much tenderness in the lines that Marron draws to communicate this emotion that we rest our gaze and stay with the sufferer. Marron is unafraid to share the challenges and pathos of the lived experience, witnessing it acutely as a paramedic. Yet his work also celebrates life throughout, most notably in Fentanyl Dreams, which vividly communicates the force of the newly born. Marron is also a sculptor. However, for the works and themes presented in Encounters, drawing for the artist facilitated a unique truth and directness. He works quickly. Once inspired, the initial charcoal drawing is ready within 3-4 hours. Structures are built around this draft, followed by revisions. The sense of speed involved in their creation imbues the pieces with much energy and a less calculated finished product. from Ambulances, by Philip Larkin. Our fragility, vulnerability, finiteness – further exemplified by the works being mounted on crutches – are clearly evidenced in Marron’s work, and are so beautifully communicated with much tenderness and compassion. GV Art London, curators, producers & artist agent, represents David Marron amongst others.